Minot State wins the NSIC regular season championship, the first ever NSIC championship for a Beavers' men's program. This hasn't happened for several years in the MIAA but I see the MIAA isn't the only conference that rewards teams for not playing games. St Cloud finished 13 games above .500 (21-8), 1-1/2 games behind Mankato (26-10) but had a .002 better winning % so they get the 3 seed. The current Gopher hockey coach who was the coach at St. Cloud said tonight at the Gopher Caravan about Big Ten hockey that the Gophers missed the NCAA playoffs by .001 to the team that won it all, UMD. So it can come down to that little bit. Or of course, it just pours gasoline on the rivalry between MSU and SCSU. Four Mavs named to NSIC all conference teams. It would seem that if anything, the team playing fewer games should not be rewarded in a case like this. Especially if the cancelled games opponent is within a reasonable distance; i.e., within 2 hours or less. For example, the MSU softball team had a weather related cancellation with SW State in April, and was not made up later. I found this surprising, as Marshall and Mankato MN are at most an hour and a half distant. Understandably, this is ultimately up to school officials, and mutual agreement. However, it would be desirable to have a more uniform conference policy in place for this type of situation. I know the MIAA doesn't allow teams to make up any of the weekend series games. I always thought that was crazy but it was explained that they don't want teams choosing which games to make up (rescheduling the series with a bottom team but not the series against one better teams) in a terrible weather year when many games are cancelled. Team that are the closest geographically usually play midweek single games in 3 different weeks and I think those games can be made up. Last edited by Randy; 05-09-2018 at 09:32 AM. I can see their rationale, but agree that teams that are close geographically should be able to make up at least those games midweek. The teams have I believe a five day window to get the three game series in. They can start as early as Thursday and go into Monday, although I don't think they can take more than one day off between games. With increased accuracy of weather forecasts I think it's worked out pretty well over the last few years. An MIAA team hasn't lost more than one game to the weather since the 2015 season. Or we've just had great weather. Augustana wins the 2018 NSIC Tournament. How did Augustana get the 5th seed in the region with 44 wins, when they were #1 in the country at the end of April? Also, how did St Cloud get in with 29 wins when they were 3rd in the regular season and got beat by Minot in the tournament? Minot had 36 wins, regular season title and got 3rd in the conference tournament that should have been more than enough to get in. Conference standings and national rankings don't mean anything in regional rankings. In basketball, the regular season title seems to mean something. Evidently it must not in baseball. Weak schedule. Part of it is the NSIC's fault for scheduling the traditionally stronger teams against each other and the weaker teams against each other with not as many games against the other group. Then they went 1-7 vs Pittsburgh St and Kearney early in the season, and SCSU was 2-0 vs then in the regular season. 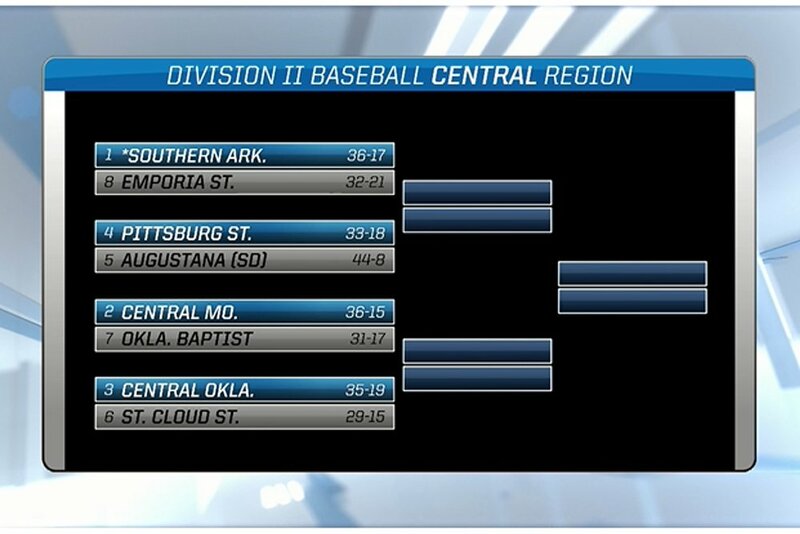 When the first rankings came out 3 weeks ago, I was surprised that CentralMO with around 10 losses was #1 and Augie with 2 losses was #2. But when I examined the spreadsheet published with the rankings, the Mules had a significantly higher SOS and had played 12 games against regionally ranked opponents compared to Augie's 4. Augie also had played 6 or 7 games against non D2 opponents while CentralMO had played 0. It was clear that Augie was being punished for not playing a tough enough schedule. Upon further review, Augie record for this process is 39-8 so they only played 5 non D2 opponents. Last edited by Randy; 05-14-2018 at 12:23 PM. Playing a D2 schedule seems to be very important in the eyes of the baseball committee. I understand it is easier for the MIAA to get non-con D2 games due to our location but part of that is an effort to schedule D2 games. The MIAA only played two games against non-D2 schools this year according to the NCAA web site where as the NSIC played 32 non-D2 games and the GAC played 27 non-D2 games.